Every motor vehicle accident is frightening; the physical, emotional and mental toll can be devastating. Perhaps no accident is more nightmarish, though, than one caused by a wrong-way driver. A driver suddenly is headed straight for you on the wrong side of the road. You have seconds, if that, to process the situation and react because the combined speeds can reach 140 mph. Do you swerve into the other lane? What if the other driver does the same? Do you intentionally drive off the road, inviting damage to your vehicle and possible injury to you and your passengers? By the time you consider your alternatives, it may be too late. 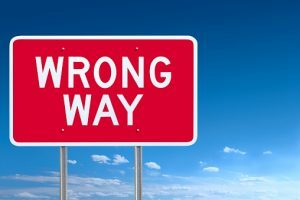 What causes wrong-way driving in Connecticut? The Arizona Department of Transportation says two out of three wrong-way crashes are caused by drunk driving. Texas A&M Transportation Institute research shows that the elderly are involved in many wrong-way crashes. Some senior citizens, perhaps recognizing that their vision and reflexes are diminished, focus so hard on their driving that they block out the awareness that they are traveling in the wrong direction. The “good news” is that wrong-way accidents are relatively rare, accounting for about three percent of all fatal accidents and about 360 deaths annually on divided highways in the U.S., according to National Transportation Safety Board statistics. Yet they pose enough of a danger that several state highway departments, citing both European and U.S. research, are studying ways to minimize the threat. Arizona, Colorado and Texas are among the states experimenting with new equipment, such as flashing roadside signs designed to warn motorists when they are driving in the wrong direction. Some systems can also alert local police and surrounding vehicles of a wrong-way driver. But, as Arizona DOT spokesman Doug Nintzel notes, technology alone cannot solve the problem. “This is first and foremost a driver behavior issue,” he said. Even if you are a careful driver, you can become the innocent victim of a wrong-way driver. The high-speed crash can leave you with major injuries and a lengthy rehabilitation. Your medical bills are piling up while you are out of work. At worst, your life may have been shattered by the loss of a loved one. Making the situation even worse is an insurance company pressuring you to accept a low-ball financial settlement. They know you are desperate. They know you need the money. What you really need, however, is an experienced Connecticut auto accident attorney on your side. The Law Offices of Mark E. Salomone & Morelli have been handling cases just like yours for many years. They know the courts. They know the insurance companies. Scheduling a free case consultation is your first step toward putting your life back together.